David Černý sculpture of the duke of Bohemia (921-935CE) Saint Wenceslas, 1999, hangs in the Lucerna Passage above viewers’ heads as a subversive icon of the Czech Republic’s social and political histories. The sculpture literally overturns the canonical imagery of a man riding a valiant steed as the saint is instead depicted riding the upturned body of a dead horse strung up to the ceiling by its hooves. The horse’s frame hangs limp, visibly devoid of life as it hangs heavily from knotted rope attached to the concourse ceiling. A depiction in stark contrast to traditional equestrian sculpture which feature powerful and noble horses full of life and visceral energy. Also unlike traditional equestrian statues the man riding the steed, Saint Wenceslas, appears to be stiff and awkward as opposed to the dominance and mastery displayed by traditional riders. This parodied rendition of the saint is made even more conspicuous due to the sculpture’s location in close proximity to Wenceslas Square which has been a central gathering and protesting concourse for Czech peoples and is home to Černý’s inspiration; an equestrian statue of Saint Wenceslas by prominent Czech sculptor Josef Václav Myslbek, unveiled in 1912. Viewer’s of Černý’s Saint Wenceslas sculptures at the Lucerna Passage would be well aware of its political and social commentary on the Czech Republic’s historical struggle for democracy. 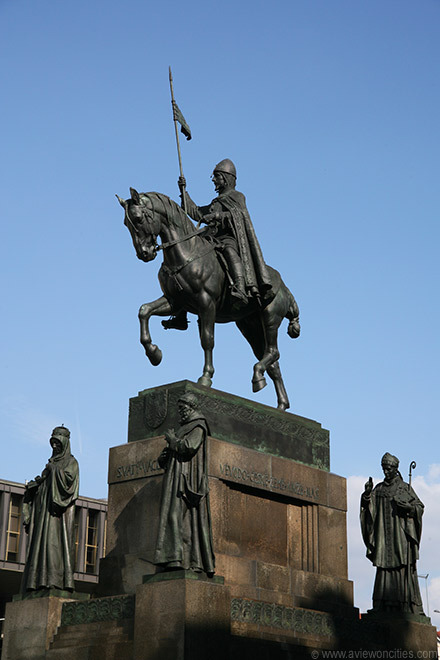 The iconic Saint Wenceslas is a cult figure and symbol of national identity for citizens of the Czech Republic and has been memorialized in multiple sculptures as well as through Saint Wenceslas square which is home to the classical version of the sculpture by Myslbek, an inspiration for Černý’s subversive version of the monument. The original statue by Myslbek, which continues to occupy the square today, is a victorious and glorified depiction of the Saint sitting proudly atop a noble steed. The scale of the monument is quite large as the 5.5 meter heigh statue of the Saint towers over head and is flanked at its base by the figures of three Czech patrons: St. Ludmila on the left, St. Agnes behind her, St. Procopius on the right and St. Adalbert behind him. Saint Wenceslas square has a vibrant and violent political history and is an iconic site of protest and public gathering in Czech Republic, therefore, the figure of Saint Wenceslas has become synonymous with such protests and political uprisings. The square, which gained is present name during the 19th century when Myslbek’s statue was first unveiled, is emblematic of a number of struggles in Czech history including the loss independence and state sovereignty on multiple occasions, waves of forced emigration, the first and second world wars, post WWII Communist rule and the 1988 Soviet occupation. The presence of the Saint Wenceslas monument ensured the square’s political and social affiliation. As aforementioned the square and specifically the steps of Myslbek’s Saint Wenceslas monument became a sites of political protest and public gathering through a number of key historical events. On October 28, 1918 Alois Jirásek read the proclamation of Czechoslovakian independence in front of Myslbek’s seminal Saint Wenceslas statue. On January 16, 1969 a student named Jan Palach set himself on fire in Wenceslas Square to protest the Soviet invasion of Czechoslovakia on 1968. In 1989 during the Velvet Revolution large demonstrations boasting hundreds of thousands of protestors were held in the square. The end of Communist rule in Czechoslovakia and the nation’s conversion into a parliamentary republic was greatly provoked and influenced by student protest in Saint Wenceslas square and the Saint Wenceslas sculpture by Myslbek became an icon of the nation’s freedom from Communist rule. These and other events have cemented the square and imagery of Saint Wenceslas’ status as synonymous with Czech struggles for power and political independence. Černý’s Saint Wenceslas is a subversive representation of Myslbek’s glorified depiction of the saint as he rides on an dead horse, upturned and strung up by its legs, appearing much more comical than valiant. Saint Wenceslas’ dead horse agitates the space and the viewer’s memory of the Czech history granting it the status of counter-monument, according James E. Young’s definition of the term. The counter-monument draws attention to the viewing public’s understanding of memory and history through its self-reflexive or self-conscious nature. The upturned horse becomes a self-referential critique of the Czech Republic’s historical struggle for independence. The dead horse is the punctum (see Roland Barthes theory of punctum in photography) in Lucerna Passage, an otherwise traditionally appointed space still reflective of the 1920s in which the passage was first built, as it pricks disrupting the public viewer’s predisposed notions of the symbolic equestrian statues of Saint Wenceslas. Černý’s reinterpretation of the Saint Wenceslas figure riding an upturned dead horse acts as a parody of Myslbek’s original provoking the viewer to question the traditionally heroic depictions of Saint Wenceslas and the Czech Republic’s historic and current struggles for democracy. The viewer of the sculpture is forced to move from passive to active viewership due to the absurd and uncanny depiction of the saint. As mentioned the punctum in Lucern Passage is the sculpture of a man riding a dead horse, as we can all understand is a feeble and no doubt unsuccessful attempt at valiance, which stands out amongst the traditional concourse and provokes the viewer’s traditional notions of equestrian sculptures of the saint causing them to reflect on the meaning of this counter-monument. The horse’s head and tail hang back limp towards the floor and its hooves bound and strung up to the ceiling making the viewer aware that both the horse and Saint Wenceslas are completely incapacitated. This uncanny disruption of the equestrian statue model through the replacement of a living for a dead horse recalls a helplessness for both man and beast and the historical helplessness experienced by the citizens of the Czech Republic in their quest for democracy. Černý, an artist famous for the controversial nature of his work, is successful in creating a counter-monument that addresses the Czech struggle for democracy and necessitates an active public engagement with the nation’s history. The statue’s location near Myslbek’s traditional monument of Saint Wenceslas and the ironic and absurd depiction of the saint creates a dialogue between the work and public viewers. 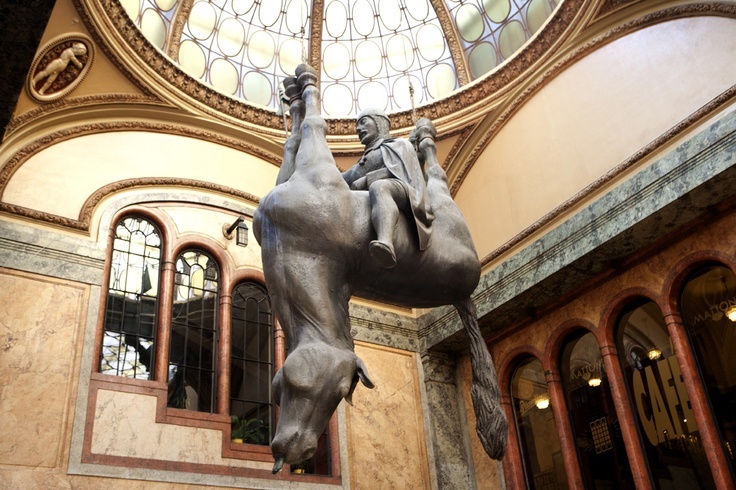 The counter-monument proposes the adoption of a critical lens when memorializing or recalling Czech histories by overthrowing the depiction of a traditional equestrian statue of Saint Wenceslas and reinvigorating the site through the inclusion of contemporary art. Young, James E. 1992. “The Counter-Monument: Memory against Itself in Germany Today.” Critical Inquiry 18 (2): 267–296.